Shelter from the glare of the sun and coverage from the rain are two crucial topics when deciding how best to decorate your patio, pool area, or backyard. 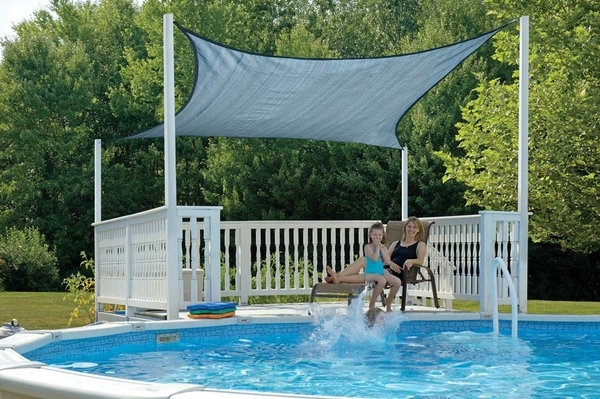 For shelter that offers a touch of sleek beauty, these shade sail canopies from ShelterLogic also provide heavy-duty construction and plenty of UVA and UVB protection - up to 90 percent. Simple installation and take down, and a one year fabric warranty are also included. Is the 16 foot measurement from corner to corner or diagonal of this 16 foot ShelterLogic Square shade sail? The measurements are from corner to corner of this shade sail, 16 x 16.